Brasil In Trio - Chorinho from Brasil, live for you in California! BRaPa - Brazilian Portuguese and Arts Program in San Diego is honored to host CHORINHO music concerts with the group Brazil in Trio, straight from Rio! ~ Nov 13th Tue - 7pm - Roda de Choro JAM at Brazil by the Bay - JOIN US! Brasil In Trio is a group of professional musicians from Brazil beautifully performing a genre of music called Choro. 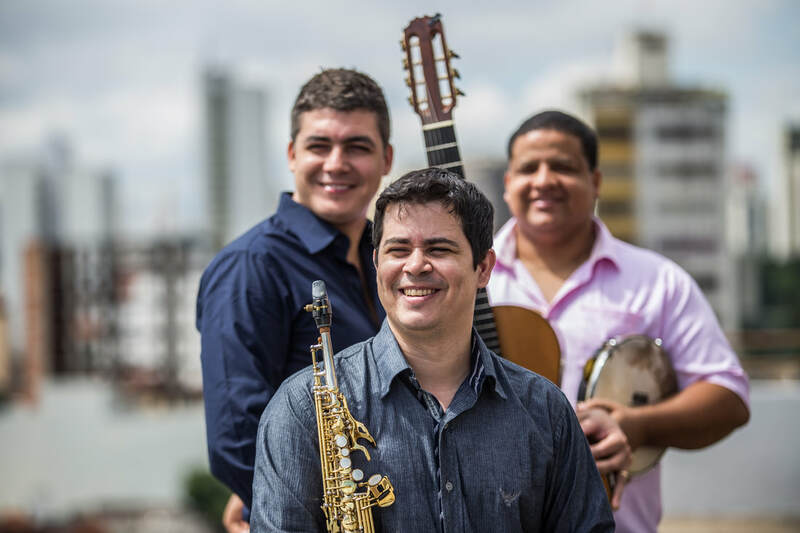 the trio presents modern and eloquent Choro music without taking away its Brazilian characteristics, full of melancholic yet festive harmonies, melodies and rhythms including Choro, Samba, Maxixe, Maracatu, Baião and much more. With this versatility the trio traveled South America in 2014 and Europe in 2015 and 2016, interpreting the music of Alessandro Branco. Besides playing concerts, the Trio also taught workshops sharing the techniques and repertoire that forms the beauty if the world in Choro Music. Atualmente o grupo está gravando o segundo CD de nome: Brasil in Trio interpreta Jarbas Cavendish. Em breve será apresentado a todos! Os três músicos atuam também como professores de música. O violonista Julio Lemos é professor da EMAC-UFG (Escola de Música e Artes Cênicas da Universidade Federal de Goiás). O percussionista Diego Amaral é professor de percussão e músico efetivo da FEF-UFG (Faculdade de Educação Física da Universidade Federal de Goiás), o multi-instrumentista Everton Luiz é maestro da Banda Sinfônica do Estado de Goiás além de coordenar o núcleo de choro da EMAC – UFG. Live Acoustic Brazilian Music for a lounge feeling at events and private parties. We play in restaurants and bars. Pop, bossa-nova, funk, classical, traditional songs. Group Nós de Chita - kids assemblies, birthday parties, libraries, festivals. The name comes from a fabric from India called Chimtz which arrived in Brazil during its colonization where it is pronounced Chita. "We who wear Chita" or "knots made out of Chita" brings arts, entertainment, live music, dance, and educational programs to schools, parties and festivals. Kids and parents play together, sing in Portuguese and learn about our rhythms! We have mainly performed for children but our adult audiences are always delighted with the experience they have when seeing a Nós de Chita. We have performed in Music and Dance Festivals such as Harmony and Motions and Romance Language Department at Harvard University and MIT in Massachusetts. Together with local professional musicians BRAPA provides a good entertainment at different events through Brazilian LIVE music. Connect and and let us know what your event is going to be and we will have duos, trios or a band to bring the best of our music - from Bossa Nova, Jazz , samba, pop and classical music to Traditional live drumming. You choose!